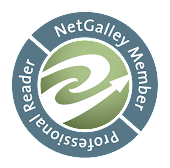 I do like subscription services. I am on one for tea and since making jewelry is definitely one of my passion, I have been looking into such services for beads. One that I have made a recent acquaintance with is Bluebarry Cove Beads. They are based in Canada and source a lot of their beads from Europe. I was lucky enough to get their November kit. It was filled with some crystal, charms, wooden buttons, dyed howlite Christmas trees, silver and copper charms, crochet beads, a beautiful golden reindeer focal and some wooden trees as well as wood blanks to do cross stitch on. All of the goodies were packaged up beautifully in a black satin bag that I can reuse. The theme was Norwegian Christmas. Some of the howlite trees were scratched on one side but overall, I was very pleased with beads and charms that were in the kit. One of the benefits of having someone else pick out my beads is the fact that since I didn't choose them, using them pushes my muse. Some of them such as the wooden buttons I didn't find a way to use yet but I will. It was well worth the $22 + shipping that each kit costs. Along with the kit, Isobel run a challenge each month to design a piece of jewelry with the prize being a free kit. 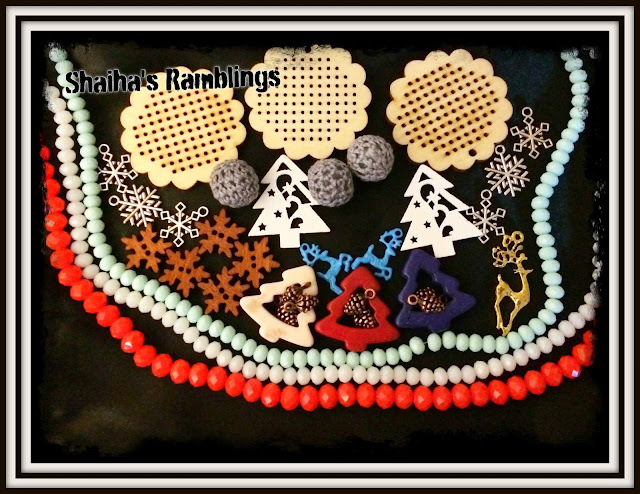 The challenge this month was to create a bracelet using the snowflake charms. 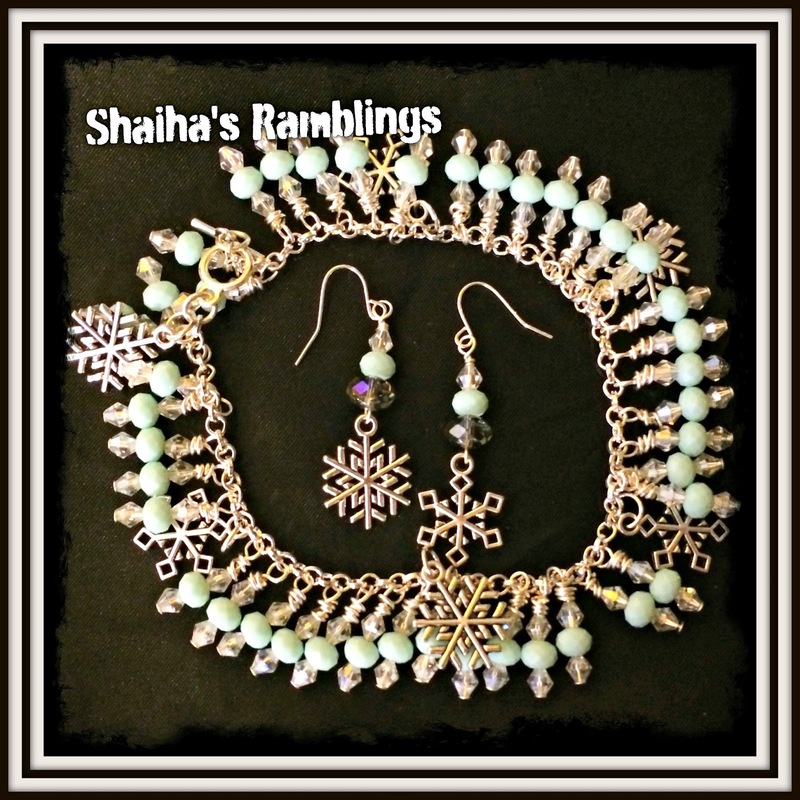 I decided that I wanted a rich charm bracelet that would work for all winter instead of aiming for Christmas jewelry. I used the fun snowflakes as well as the minty green crystals from the kit. I added in some clear crystal to give it that icy, wintery feeling. I also made a pair of earrings to go with this rich bracelet. Perfect for any party this season. I kept finding myself going back to those howlite Christmas trees and made up a necklace using the blue one along with the cute crochet beads and the white crystals that came with the kit. I added in some Czech druk beads, some pewter star spacers and the clasp. I am rather happy with how this necklace came out. I think that I am going to have to do a search and find some more of the crochet beads. Thank you Blueberry Cove Beads for introducing me to them. 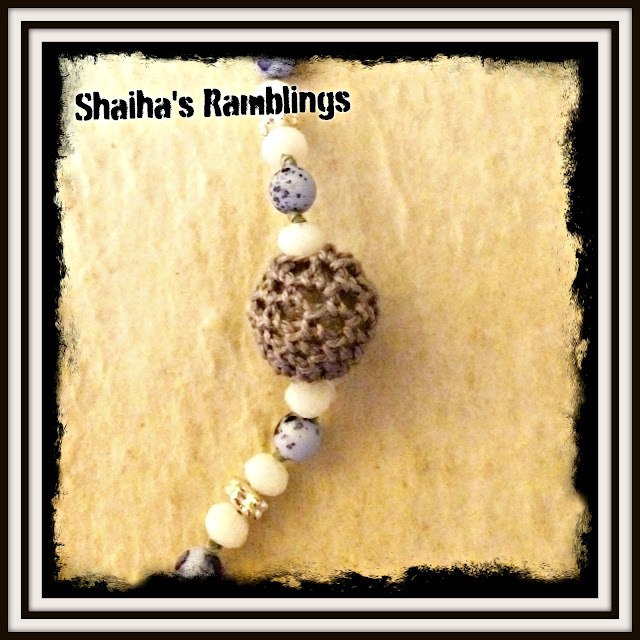 Here's another view of the crochet beads. Yep. I am a convert to them. 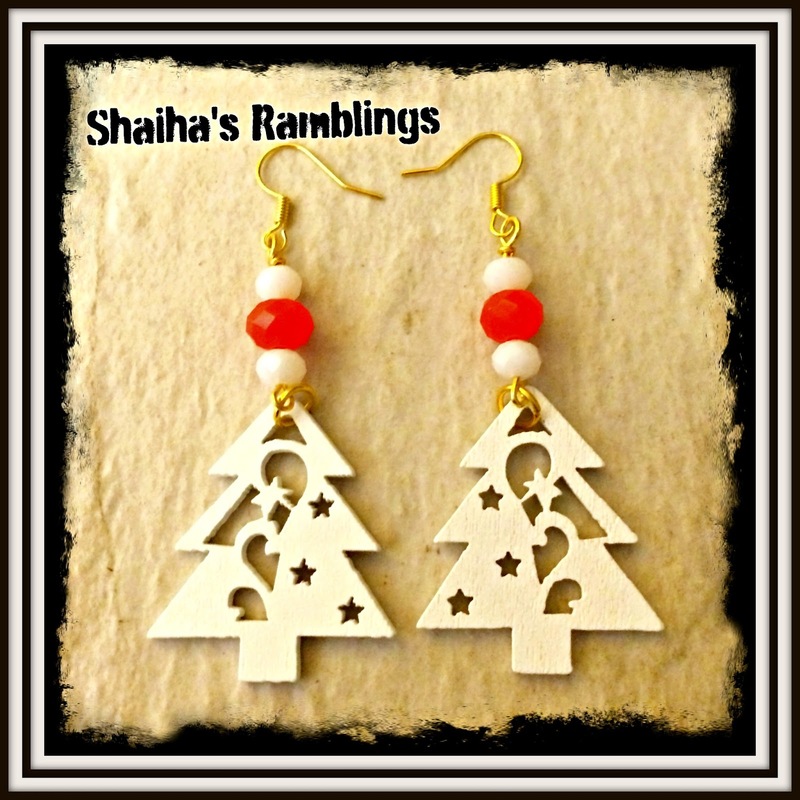 My final design was a quick pair of Christmas earrings using the wooden tree beads as well as some of the reddish and the white crystal beads. I still have one of the trees left and am planning on doing up a necklace to go along with them. I really enjoyed working with these beads and Blueberry Cove Beads subscription service is a wonderful way to stretch your creativity in new directions. The European spin that Isobel puts on her kits is simply wonderful for us American beaders. I love your crochet beaded necklace!! 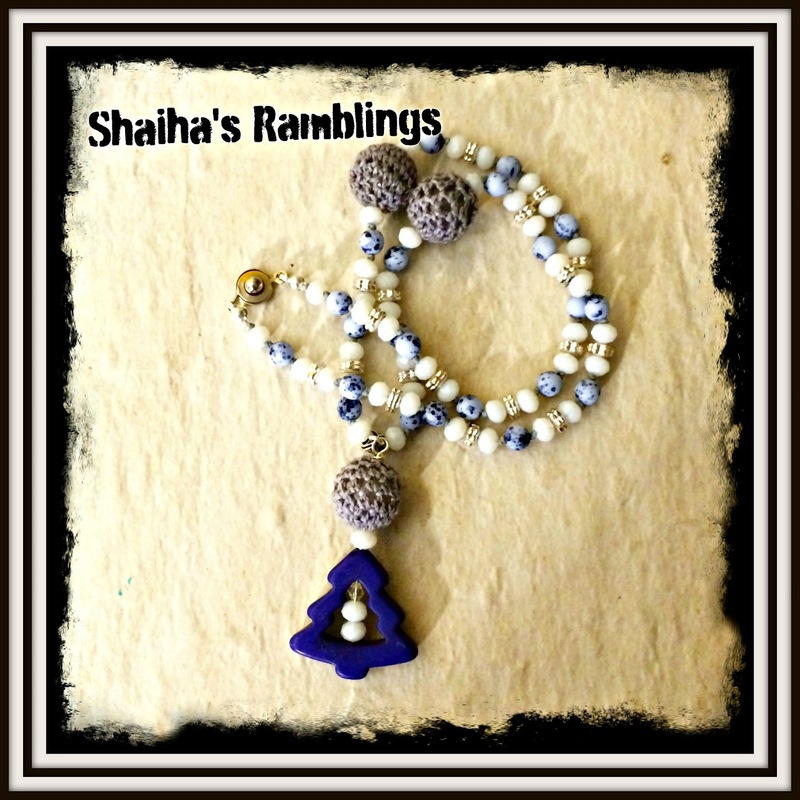 The blue beads are lovely.